Creative Commons, Royalty Free, & Public Domain Licenses » The Indie Design Co.
Have you found yourself knee deep in stock photography sites, wondering what the differences between Royalty Free, Creative Commons, and Public Domain Licenses are? Do I have to pay anything? Do I need to give credit to the photographer/author/designer? Aaaargh! Fear not, my friend, I’ve come to the rescue with this useful guide. So… Getting down to it… Almost everything that you find on the web has copyright protection, and using it without permission or payment will potentially create a lot of trouble you don’t need! (Because, who needs the additional stress!! #amiright) Listed below are the main license types you will come across, with a short description and link for further reading. When a work is in the public domain, it’s free for use by anyone for any purpose without restriction under copyright law. Public domain is the purest form of open/free since no one owns or controls the material in any way. Read more about Public Domain – copyright & fair use here. Royalty free refers to the right to use copyright material or intellectual property without the need to pay royalties or license fees for each use, per each copy or volume sold or some time period of use or sales. Read more about Royalty Free licenses on this Wikipedia page. 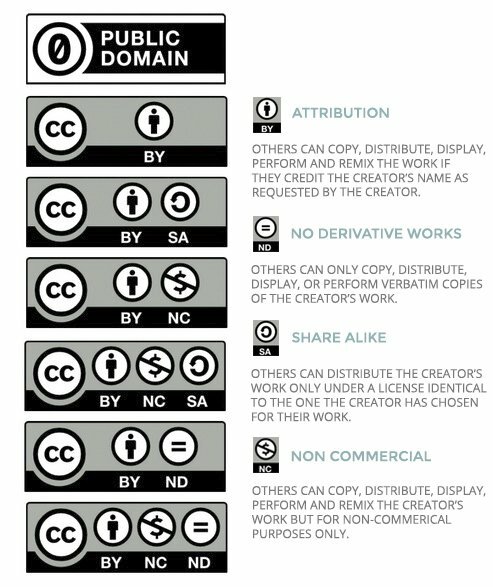 Creative Commons copyright licenses forge a balance inside the traditional “all rights reserved” setting that copyright law creates. They give everyone from individual creators to large companies and institutions a simple, standardised way to grant copyright permissions to their creative work. You can read more about Creative Commons Licenses on their website here. The illustration shown below highlights some of the different license options available. Please Note: It is so very important that you conduct your own research, paying attention to license types of each stock element you are wanting to use as these can vary, even on the same website. Check, check, and check again… You may be required to credit the owner of the image/design piece/video/sound clip etc… Or pay for the element, or you may be allowed to use it for personal, but not commercial, use, or it may just be a complete no strings freebie! I cannot advise on the terms & conditions of a website, so please read the terms thoroughly as and when you find something you would like to use. I have curated a list of 47 free stock photography websites which you can view here, but again, please remember to check the license terms!